SAF-T-EZE®GP - Aircraft Grade Anti-Seize is compounded from graphite and petrolatum to satisfy the requirements of MIL-T-5544 and SAE AMS2518 for use on threaded joints. This anti-seize is a NATO defined product S-720 for aircraft spark plugs. 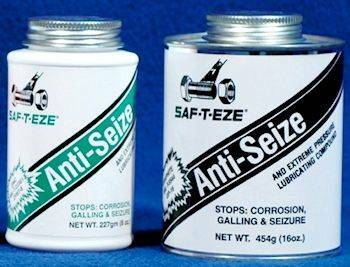 SAF-T-EZE® ZP - Aircraft Grade Anti-Seize is compounded from zinc and petrolatum to meet MIL-T-22361 and A-A-59313 requirements for use on threaded steel parts assembled in aluminum or zinc castings. SAF-T-EZE Aircraft Grades Anti-Seize are also used in other than aircraft precision applications. They do not contain lead, copper or molybdenum disulfide. Certificates of conformance are available for each batch. 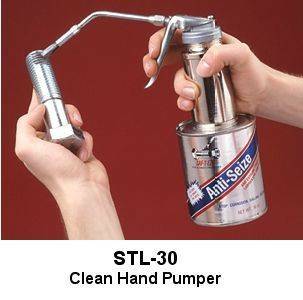 GP Anti-Seize can be used as a lubricant, a sealer, a break in lubricant, a tapping compound on plastics as well as metals. Surface need not be cleaned before application unless grit or low quality oil/grease is present and ultimate performance is required. The reduction in assembly friction increases torque tension by about 20%. Use on threaded parts, bushings, gears, valve stems, chain sprockets, levers, hinges, pivots, rollers, heat exchanger, manifold bolts, as a gasket release agent and was developed for aircraft spark plugs. It is recommended for use with austenitic stainless steel, titanium, nickel and high chromium steels. It is not recommended for use with low quality steel, aluminum or cadmium. ZP Anti-Seize an be used as a lubricant, a sealer, a break in lubricant, a tapping compound on plastics as well as metals. Surface need not be cleaned before application unless grit or low quality oil/grease is present and ultimate performance is required. The reduction in assembly friction increases torque tension by about 20%. Use on threaded parts, bushings, gears, valve stems, chain sprockets, levers, hinges, pivots, rollers, heat exchanger or manifold bolts, or as a gasket release agent, etc.